Today Lord Gardiner visited Taylors Bulbs’ Daffodil Day event in Holbeach, Lincolnshire, co-hosted by the Royal Horticultural Society. 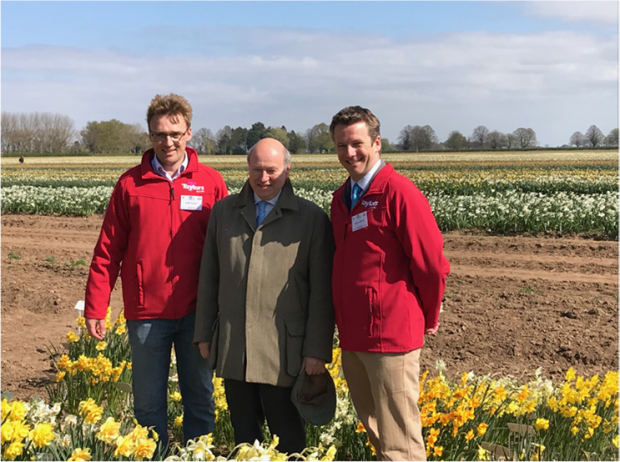 As part of the event today, Lord Gardiner had the opportunity to meet bulb expert, Christine Skelmersdale, and daffodil breeder, Brian Duncan, as well as the fourth generation of Taylors, who currently manage Taylors Bulbs. He also toured the bulb fields and the Taylors trial ground, where he saw over 4000 varieties of daffodils currently being grown and the machinery involved with producing flower bulbs. Taylors Bulbs are celebrating their centenary this year. Over four generations they have grown to be the UK’s leading supplier of flower bulbs. Starting off with 4 hectares of land, Taylors Bulbs now have over 750 hectares, over 150 of which are used for growing daffodils. It is wonderful to be in Lincolnshire celebrating the success of Taylors Bulbs over the last 100 years and four generations of flower bulb farmers! We have a thriving flower farming sector here in the UK and it is fantastic to talk to the people involved in producing top quality daffodil bulbs. Successful businesses like Taylor Bulbs show how investing in innovation and expertise can help enterprises go from strength to strength.